OCEAN front-newly remodeled. Open April-Jan!!! HEAR the WAVES from YOUR BALCONY! NEW: Kitchen w/stainless steel appliances, Granite, Custom Cabinets. pillows, fluffy towels, HD 40"
towels and much, much more. All the comforts of home! This was a last minute trip and the perfect place for us for the week. It had everything I needed for cooking a home cooked meal (one night). It was so close to any and everything. Went fishing on a charter boat, brought the fish filets back then walked to Johnny Longboats restaurant where they coooked up our very own fish for 15.99 which came with 2 sides. Amazing! Not direct ocean front but the balcony overlooks the ocean from the side and is DIRECTLY OVER THE POOL!!! The perfect view for both. Again... it was perfect for us! Stayed at this property for the summer. Great view of the ocean and pool. Short walk to the beach. The condo itself was spacious, clean, and everything was in working order. Condo owner's were more than attentive to any questions or concerns we had. The condo building was well maintained and everything in working order. Would stay again and would recommend to others! This was our first month-long vacation/condo experience and I must say we loved this place! It was just like living at "home". We had all the amenities we could need or want. The place was beyond beautifully decorated, it was exquisite! I couldn't get over all the (feather?) pillows, everywhere! The balcony and view was what I was really looking for when we booked this place. It didn't let us down. Every morning we'd sit on the balcony with our coffee and the binoculars (those were supplied) and enjoy the ocean view and pool view. Many condos look at the ocean but you are over the parking lot... not us, we had the pool just below us and looking out over the beach and ocean! (Almost) every late-afternoon we would also sit out there and enjoy a cocktail or two (our own Happy Hour). The location is great! We stepped onto the beach, stepped out to the pool, walked a couple of blocks to dinner and shops. Many days we would walk the island stopping for breakfast or lunch or a happy hour! EVERYTHING is very close by. I was very anxious booking a place online ... not knowing the owners or seeing the place in person, sending all that money was very scary! Jim & Marcy were great and their "place" was even more than we expected. We are hoping to be yearly renters at this great place... perfect is all I can say! I had the pleasure of spending the entire month of June in this beautiful, yet comfortable, home away from home! First off, let me express how wonderful Marcy is! She really makes sure you have every comfort from home in your vacation condo. We needed nothing when we arrived. Her decor was luxurious and expensive, yet you didn't feel like you couldn't sit on the furniture. The remodeled kitchen had everything you needed to eat a left over or make a full dinner. Marcy really did a great job remodeling this condo. Next, I can't express how special it was to have the pool pretty much to ourselves on most days. The pool and the beach that is. It was like our own tropical vacation home. June isn't very busy there and those that were at the pool or beach were so inviting and friendly. Rip, the owner of the cabanas on the beach, was very accomodating as well. He made a great deal with us for chairs and umbrellas. 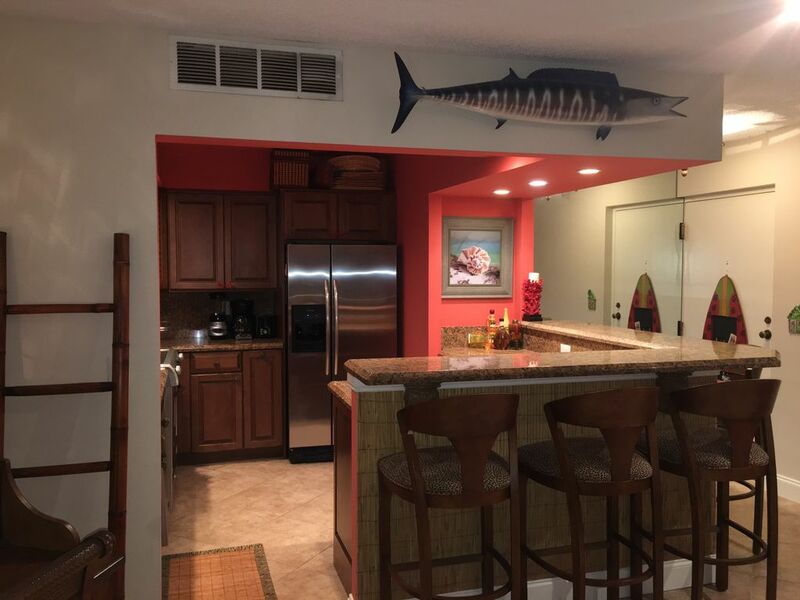 I could go on and on, but trust me...I have rented many places on many beaches (mostly on the Gulf side), but Marcy's and Jim's condo has been one of the best. There are a ton of things to do in Palm Beach Gardens and City Place was a short ride away. If you are looking for a laid back yet elegant home for a vacation then this is the place. The only thing that I would recommend is Internet access in the condo. you can get a slight wifi from the clubhouse, but it was spotty. Other than that it's PERFECT!! We hope to be back in June of 2011!!! See you then, Marcy! BEST Beach on the ISLAND! and FABLOUS SHOPPING on PGA!